WHEN: Sunday, April 19, beginning at 10 AM. Rain date is Sunday, April 26. 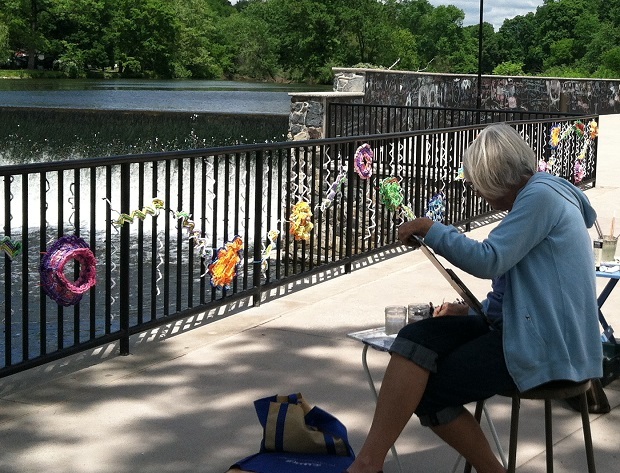 Artists of all skill levels can enjoy a fun day outdoors creating art at one of New Jersey’s most scenic vistas along the south banks of the Raritan River. Artists are welcome to work with watercolors, pastels, charcoal or any other media. The daylong event concludes with a reception and juried show on HAM’s outdoor terrace. The best painting in the show, as determined by the jurors, will receive a $100 prize. Honorable Mentions will also be noted. Artists can learn more about the event and register online through the Hunterdon Art Museum’s website. Artists can also register the day of the event in the Red Mill’s parking lot. Artists Maureen Chatfield, Chris Koep and Casey Ruble will serve as jurors. Chatfield has taught several classes at the Hunterdon Art Museum. Her work has been shown in numerous exhibitions and is in private and corporate collections, including Decca Records and Tiffany & Co. Koep is an Associate Professor of Painting and Drawing at Raritan Valley Community College, and has received a pair of New Jersey State Council on the Arts fellowship grants, as well as McDowell, Yaddo and Millay fellowships. Ruble, who is represented by Foley Gallery in New York City, was included in HAM’s Disparate Roots: Contemporary Collage exhibition. Her work has been featured in numerous group and solo shows.